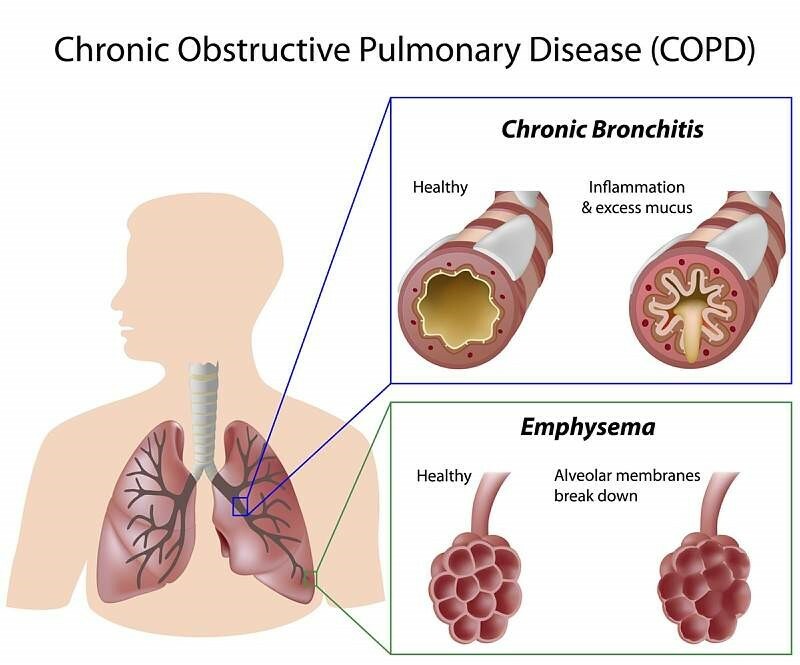 Chronic obstructive pulmonary disease (COPD) is a condition involving both emphysema and chronic bronchitis. Emphysema is characterized by permanent enlargement of the bronchiole and alveoli (air sacs) due to loss of elasticity. The condition is also accompanied by destruction of the lining between the air sacs where the exchange of oxygen and carbon dioxide occurs. The damage of the alveolar walls reduces the surface area for oxygen and carbon dioxide exchange causing reduced oxygen intake. The loss of the elasticity makes it difficult to blow air out from the lungs. The most common symptom is shortness of breath, especially on exertion. Other symptoms include wheezing, dry cough, and chest tightness with exercise, phlegm production, and unproductive cough. Patients may need oxygen support as their condition progress due to airflow obstruction in severe emphysema caused by the collapse of the elastic tissue surrounding the alveolar septa. To maintain a healthy lung structure, the lungs have the ability to remove unhealthy cells and replace them with new healthy cells. The removal process is catalyzed by the proteases including neutrophil elastase, proteinase 3, macrophage elastase and matrix metalloproteinases. To balance the proteolytic activities, inhibitors such as a-1 antitrypsin produced by the liver can inhibit the elastase produced by neutrophil. Lung inflammation and infection from bacteria or influenza virus and reactive oxygen species or toxic chemicals such as nicotine from smoking can trigger TNF and chemokines including IL-8 which cause infiltration of neutrophil and macrophage to the alveoli and release of high amounts of proteases. Abnormal high proteolytic activity and/or decrease or deficiency of a-1 antitrypsin results in lung tissue damage and loss of elasticity. In addition to abnormally high proteolytic activity that dissolves lung tissue, emphysema can also be caused by low levels of tissue regeneration and repair due to low enzyme activities including histone deacetylases (HDACs), factor-1a (HIF-1a) etc. HDACs are a class of enzymes with activities that increase the tightness of the histones to wrap the DNA. Such activity regulates gene expression and controls the maintenance of lung alveolar septal structures. Research has found that HDAC expression in the lungs are abnormally low in COPD patients. Inhibitors that suppress HDAC activities causes partially reversible emphysema in animal studies. Low HDAC can be caused by genetic, infections, malnutrition, smoking or alcohol. 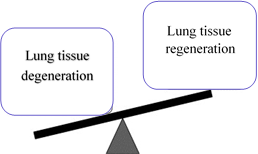 The reduced metabolic activity towards tissue growth and/or increased metabolic activity toward tissue dissolving causes lung structure degeneration leading to the development of emphysema. Chronic Bronchitis is the chronic inflammation of the bronchi due to infection or inflammation. It causes bronchi lining degeneration and hypertrophy of goblet cells with hypersecretion of mucus. The excessive mucus blocks the airway further exacerbating inflammation and infection. Over time the condition leads to the degeneration of bronchi bronchiolar wall fibrosis and eventually, scar tissue forms in the lungs which obstruct the airflow and doesn't allow the lungs to take in as much oxygen as needed. Chronic bronchi inflammation will also cause emphysema. Chronic bronchitis is almost always coexistent with emphysema. Symptoms include shortness of breath, cough and sputum production, wheezing, and difficulty breathing when lying down.